Tyrone Murphy stood, pleaded, demonstrated and admitted to killing his 30-year-old neighbor Thursday during his first-degree murder trial. The 58-year-old called the June 2017 slaying of Ashley Cates self defense. The prosecution did not seem amused. "You do remember her screaming?" asked Executive Assistant District Attorney Cameron Williams. "It wasn't really a scream, scream," Murphy said. "It was loud enough that [a neighbor] heard it," Williams said. "We just don't know what he heard," Murphy said. "You tried to rip her shirt off," Williams said. "No, sir, that was all part of the struggle," Murphy said. "You tried to take her clothes off," Williams said. "You can't put that on me, sir," Murphy said. "I told you what happened, and you're trying to deal cards from the bottom of the deck." Prosecutors say Murphy stabbed Cates more than 15 times at 1512 Bailey Ave., where they both lived, on June 4, 2017, and have been trying him for first-degree murder and tampering with or fabricating evidence since Tuesday in Hamilton County Criminal Court. 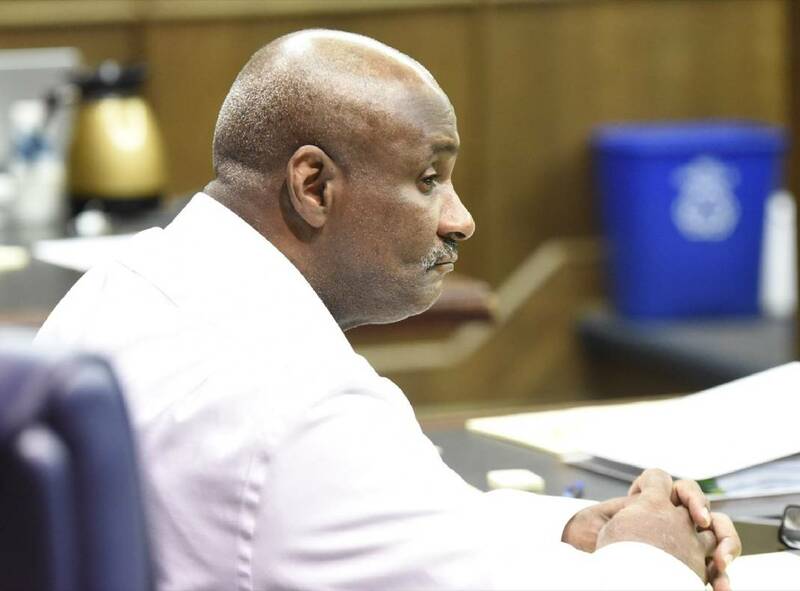 After the killing, Murphy cleaned up the blood, stuffed some of her possessions into a bag, hid that bag in the apartment complex's laundry room, began to wash his own clothes, and never called police until Cates was found on June 5, prosecutors said. When brought in for questioning, Murphy told investigators that he cut up his hands throwing away a garbage bag with glass in it at his job at Sticky Fingers. He denied any involvement and told investigators his blood wouldn't be in her room. But prosecutors said Murphy was lying. To prove their case, they called a forensic expert who said Murphy's blood was on swabs from the crime scene; a witness who saw Murphy with a woman resembling the victim around 2 a.m. the night of the murder; family members who recalled finding Cates the next day on her apartment floor, legs crossed and covered in blood; and a medical examiner who said it appeared from hand marks on her bloody legs that her attacker was trying to pry them apart. After prosecutors rested their case Thursday afternoon, Murphy took the witness stand. He denied trying to pry Cates' legs open, but otherwise admitting to killing her and cleaning the scene. He said Ervin Tanner, the state's witness who placed him with the victim around 2 a.m., lied and was actually talking about the night before. Murphy said he came home from work on June 4 and climbed the stairs to his second-story apartment. Then, "a door came flying open, and a lady came running out, hair bushy, eyes big," Murphy said. It was Cates and she had two knives in one hand, Murphy said. Murphy said he didn't know why Cates attacked him. But she refused to listen, he said, and their "five, seven, eight" minute struggle, which he re-enacted multiple times, ended with her dead in her apartment room. "Where were the knives?" Assistant Public Defender Ted Engel asked. "They were right there [beside her]," Murphy said. Prosecutors said investigators never recovered any knives from the scene; they only found the tip of a knife broken off in Cates' head. Williams told Criminal Court Judge Barry Steelman a plumber claimed to have recently discovered bits of a knife in Murphy's old apartment. But Williams said he'd only learned that information Wednesday morning and didn't introduce it to jurors. Murphy, who faces a life sentence if convicted, pleaded with jurors not to send him to prison "for the life I got left." He said he never called the police because he was "nervous, scared as hell." He said he was otherwise doing everything right: He worked, had insurance, was saving money. "I come home from work, I been doing it for four years, ain't nobody ever bothered me," he said. "I was drug free, alcohol free that night. Wasn't nothing wrong with me I don't know, I don't even know these people. She would've loved me if she'd got to know me. I'm a good guy." Jurors will return today at 9 a.m. to hear closing statements and then begin deliberating.